Adam Lambert announced that “Whataya Want From Me” music video will set to premiere between 6am-10am on January 15 on VH1. Kris Allen’s Wife Got Tiger Woods Syndrome? Kris Allen’s wife is reportedly affected with Tiger Woods’ syndrome, which is an epidemic that caused paranoid wife constantly worry that their “nice guy” husband is secretly cheating on them. Read moreKris Allen’s Wife Got Tiger Woods Syndrome? Last minute requests to have Adam Lambert, Kris Allen and Allison Iraheta perform ‘one-of-a-kind’ concert in one particular town are personally encouraged by them. “American Idol” stars Kris Allen and Adam Lambert became the cover image of Billboard for its latest issue. Adam Lambert was spotted as he arrived at L.A.’s Nokia Theatre for American Music Awards rehearsals on November 19. 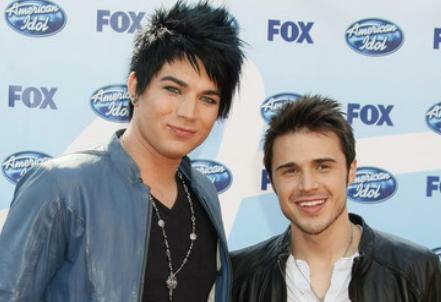 Adam Lambert dismissed the speculation of any rivalry between himself and “American Idol” winner Kris Allen. Adam Lambert, Kris Allen and Allison Iraheta are heading for a reunion concert as Ryan Seacrest announced that the Idol alums are ready to perform live for the city with the most demands. Three alumni of ‘American Idol’ season 8, Kris Allen, Adam Lambert and Allison Iraheta, have something in common for their upcoming albums, that is Kevin Rudolf’s involvement. Adam Lambert has joined the celebrities who voiced their opinion over Kanye West’s VMA stunt. Kris Allen and The Calling’s frontman Alex Band are working on two killer songs together as the “American Idol” season 8 winner wrote on his Twitter. Adam Lambert seemed to stood out when when the American Idol Top 10 finalists performed Sunday night at Cleveland State University’s Wolstein Center. Adam Lambert and Kris Allen are more than just good friends — they make sweet, sweet music together, too. The top four finishers are saved for the second half — after the intermission, which renders this more a theatrical revue than a traditional concert. Allison Iraheta hits a snag right away. She sings Pink’s “So What,” with a wind machine to blow on her hair. All that means is that she can’t move.